Dr. Thomas Hügle has obtained his medical degree at the University of Freiburg in Germany 2001. He performed his clinical training in Internal Medicine and Rheumatology at the Ospedale Civico in Lugano (Switzerland) and the University Hospital in Basel. He also worked clinically at the Hôpital Necker in Paris (Nephrology and Immunology) and the James Cook University Hospital in Middlesbrough, UK (Rheumatology). Dr. Hügle received his MD 2001 in the field of chronic inflammation and fibrosis in Hepatitis C Infection at the University Freiburg. This work was awarded with the Heinz-Kalk Memorial award. In 2008 he performed his PhD in Newcastle upon Tyne, UK entitled „The Role of Inflammation in Systemic Sclerosis“ under the supervision of Prof. Jaap van Laar. 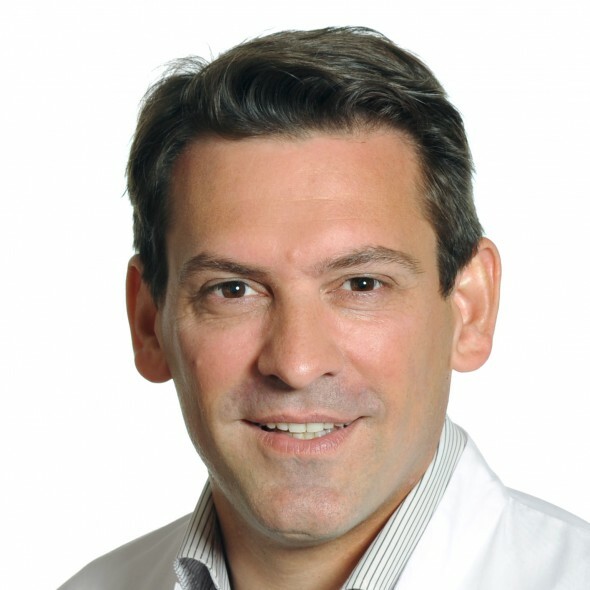 Dr. Hügle joined the Osteoarthritis Research Group Basel 2011. He has subsequently set up the Osteoarthritis Research Lab and the Osteoarthritis Research Center Basel. From 2010 he worked as consultant in the Rheumatology department at the University Hospital Basel and was finally appointed 2016 as Professor and head of department of Rheumatology in Lausanne. Before that, he obtained a Master degree in health care management at the Technical University of Kaiserslautern in 2015. His research interest is in the role of chronic inflammation in primary and secondary osteoarthritis and in digital rheumatology. He has also a strong interest in technical innovation: he invented and developed in collaboration with the company Dr. Karl Storz Tuttlingen the „Retroforceps“ for synovial biopsies. Dr. Hügle also patented the first anatomic forearm crutch shell named „Ulnar Pro“, which is currently produced by the European market leader Rebotec. Synovial fluid metabolomics in inflammatory- and osteoarthritis assessed by nuclear magnetic resonance spectroscopy. Clinical and Experimental Hügle T, Kovacs H, Heinen I, Daikeler T, Valderrabano V. Rheumatology. 2012. Wirkung und Nebenwirkung von Sport auf die Arthrose. Hügle T. and Valderrabano V. Schweizerische Zeitschrift für Sportmedizin und Sporttraumatologie. 2011;50: 153-57. Quo vadis Arthrose? Hügle T. and Valderrabano V. Editorial. Schweizerische Zeitschrift für Sportmedizin und Sporttraumatologie 2011;50: 152. Binai N, O’Reilly S, Griffiths B, van Laar JM, Hügle T. Differentiation Potential of CD14+ Monocytes into Myofibroblasts in Patients with Systemic Sclerosis. PLoS ONE 2012. Egloff C, Hügle T, Valderrabano V. Biomechanics and pathomechanisms of osteoarthritis. Swiss Med Wkly. 2012 Jul 19;142. Cell-to-Cell Contact of Activated Mast cells with Fibroblasts and Lymphocytes in Systemic Sclerosis. Hügle T, White K, van Laar JM. Annals of Rheumatic Diseases. 2012. Late-onset systemic sclerosis–a systematic survey of the EULAR scleroderma trials and research group.database. Hügle T, Schuetz P, Daikeler T, Tyndall A, Matucci-Cerinic M, Walker UA, van Laar JM; EUSTAR members. Rheumatology (Oxford). 2011 Jan;50(1):161-5. Mast cells are a source of transforming growth factor β in systemic sclerosis. Hügle T, Hogan V, White KE, van Laar JM. Arthritis Rheum. 2011 Mar;63(3):795-9.